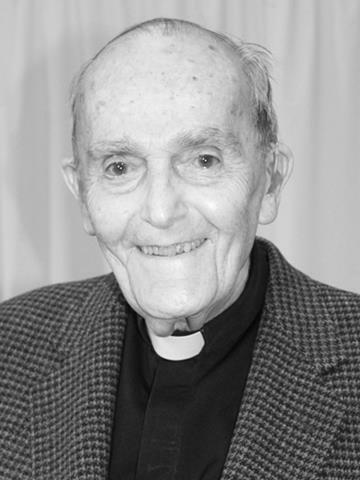 Father Raymond F. Sullivan died on May 15, 2015 at Mission St. Teresa, Maryknoll, New York. He was 88 years old and a Maryknoll priest for 60 years. Raymond Francis Sullivan was born on February 14, 1927, in Brooklyn, New York, son of Raymond F. and Marion Reilly Sullivan. He has two sisters, Eileen and Sheila. He attended Immaculate Heart of Mary Grammar School in Scarsdale, New York. After graduating from Iona Preparatory High School in New Rochelle, New York, he enlisted in the Navy V-12 Program and was commissioned an Ensign in April 1946. He graduated from Harvard University, Cambridge, Massachusetts in 1947 with a Bachelor of Arts degree in War Service Sciences. In June 1947 Father Sullivan entered Maryknoll at Maryknoll Apostolic College (Venard), Clarks Summit, Pennsylvania, where he took special Latin Studies during the summer, and that fall he began his studies at Maryknoll Seminary, New York. He received his Bachelor of Sacred Theology in 1953 and his Master of Religious Education in 1954. Father Sullivan was ordained a priest in Annunciation Chapel at the Maryknoll Sisters Motherhouse in Ossining on June 12, 1954. After ordination Father Sullivan was assigned to the Maryknoll Mission Region in South Korea. He studied the Korean language at Yale University for one year. From 1955 to 1970 he served in the Cheong Ju Diocese, in parishes in Chungju, Po Eun, and Cheongju. During home leave in 1961 Father Sullivan was assigned to the Promotion House in New York City, where he served for a year, primarily in vocation recruitment in the Bridgeport and Hartford (Connecticut) Dioceses. In September 1962 he was appointed Vicar General of Cheongju Diocese. He served in that post until 1968, at the same time serving as Pastor of the Cathedral Parish, where he worked for more than 10 years. In 1971 Father Sullivan was assigned to a new form of ministry, Social Communication. He moved to Seoul, where he founded the Korean Bishops’ Commission for Mass Communication. While working to obtain scholarships for young Korean priests to do graduate studies in Communication, he conducted workshops for priests and sisters and retreats for professional journalists and broadcasters. In 1977 he took a sabbatical to study at Fairfield University, where he earned a Master of Arts degree in Communications. In 1983 he started The Media Awareness Education Office and worked there until the end of 1989. Beginning in 1972 for the next fifteen years, Father Sullivan celebrated Sunday Mass regularly with the Catholic Blind Apostolic Association members in Seoul. During his time in Seoul, Father Sullivan came to be involved in various music projects. In the name of the Korean Bishops’ Commission for Mass Communication, Father Joseph Na and Father Sullivan created an annual Catholic Pop Song Award event; and Father Sullivan became well known for translating popular song lyrics into English. In 1986 and 1987 Father Sullivan produced two albums. Proceeds from sales of the first album, nearly $100,000, went to Cambodian land mine victims and to Raphael House, a place in Seoul which cares for people who are both blind and deaf. He used the proceeds from sales of the second album to buy hearing aids for over 100 needy, hearing-impaired children. In 1997 Father Sullivan received a trophy in recognition of his work from the Korean Pop Singers’ Association. He wrote the lyrics and melody for “Christ, Our Peace,” the English theme song for the 44th International Eucharistic Congress, which was held in Seoul in 1989. In November 1989 Father Sullivan transferred to Hong Kong, where he spent three years working with Vietnamese refugees (Boat People), and also ministering to the Korean Catholic community there. In 1993 at the conclusion of a nine-month sabbatical program at Gonzaga University in Spokane, Washington, Father Sullivan asked for enrollment in the Maryknoll Special Society Unit for health reasons. This was granted, and he lived at the Maryknoll Society Center in Ossining, New York. For a period of almost six years, he celebrated Sunday Mass with the Korean Catholic Community at St. Michael’s Church in Greenwich, Connecticut. He participated in the Inter-Chapter Society Assembly (ICSA) in 2000. When the Special Society Unit was discontinued, he entered the Senior Missioner Community (Retirement Community) in February 2001. For many years Father Sullivan, although retired, helped in neighboring parishes. In November 2013 he moved to Mission St. Teresa. Wake services were held at 4:30 p.m. on May 18, 2015 at St. Teresa’s. Father Sullivan’s family received condolences and prayers at 9:30 a.m. on May 19, 2015 in the Lady Chapel. The biography was read by Rev. David Pfeiffer. Mass of Christian Burial followed and was concelebrated in Queen of Apostles Chapel at 11:00 a.m. Father Alfonso Kim was Principal Celebrant and Father Michael Duggan was homilist. Burial followed in Maryknoll Society Cemetery with Father Thomas O’Brien conducting the graveside service.